People who prefer a soft mattress face a difficult task. You need to get a mattress that’s soft enough to be comfortable, but at the same time provides the right kind of support in the right places to keep your body in the proper alignment. A failure to do this risks creating a situation where either your mattress isn’t comfortable for you to sleep on, resulting in bad rest, or where you have to toss and turn, resulting in awkward pressure points that can leave you waking up with aches and pains. In order to help soft mattress sleepers make the best decision, we’ve put together this handy guide. We’ll explain the difference between support and firmness, discuss who might benefit most from a softer mattress, explore how softer mattresses work with cooling, and how a softer mattress can help you manage your back pain. Finally, we’ll list some of the best soft mattresses on the market today so you can take the next step in your quest to find the perfect mattress for you. Who Benefits from a Soft Mattress? One of the first things that should be noted when you’re talking about the softness or firmness of a mattress is the difference between firmness and support. Common wisdom holds that a soft mattress is more likely to cause back and neck problems then a firm mattress. However, this simply isn’t the case. The most important factor in determining whether or not a mattress will be a pain in the neck is the kind of support it gives. When talking about mattresses, support refers to how well the mattress keeps your body in its natural and best alignment. Traditionally, softer mattress didn’t do a very good job at this, as people would sink where their body is heavier but remain propped up where their body is lighter. However, with the rise of the modern foam mattress, that’s no longer the case. Many foam, hybrid, and even coil mattresses can offer sleepers a soft feeling that allows them to sink in, while at the same time giving their body the support it needs to stay in the proper alignment. The key is all about making sure that the way your body sinks into the mattress doesn’t cause your spine, neck or hips to be misaligned. Modern mattresses do this through several means, such as different support zones, or through the inherent qualities of the materials used in their construction, so don’t let yourself be fooled into getting a stiff mattress instead of the soft one you want because you fear neck and back problems. When it comes to understanding what kind of sleeper benefits most from a soft mattress, it’s important to keep the idea of support in mind. Generally, side sleepers will get the most out of a soft mattress. This is because of the unique pressure points that side sleepers have to deal with. When you sleep on your side, your body weight shifts dramatically. Your hips and shoulders suddenly pull on your body much more than they would if you were on your back. The result can be various types of aches and pains. However, a softer mattress allows side sleepers to assume their favorite sleeping position without worry, as the softness of the mattress helps create a natural hug and contour that provides more support where your body is applying more pressure. This helps keep your neck, back, and hips lined up so you can wake up feeling well rested and ready to tackle your day. Another group of sleepers that generally prefers a soft mattress are those who weigh less than average. For sleepers under ~150 lbs, a mattress with a medium level of firmness can create more pushback than their bodies can overcome. When this happens, sleepers can get a sensation of floating on top of the mattress. Moreover, when you’re not pushing into the mattress correctly, you won’t get the support your mattress is intended to provide. Therefore, lighter sleepers oftentimes prefer a soft mattress. Cooling is an important attribute for any mattress, and soft mattresses are no different. Some people fear that softer mattresses will sleep hotter than a firmer mattress. While this can be the case, the vast majority of the factors influencing how hot or cool your mattress sleeps are determined by factors other than its softness. Softness can create a warmer mattress because the increased amount of hug and contour you get from a soft mattress holds more of the mattress’s material against your skin. As a result, less surface area of the mattress is exposed, so heat can become trapped more easily. There are several innovations in mattress technology that have risen to overcome this issue. 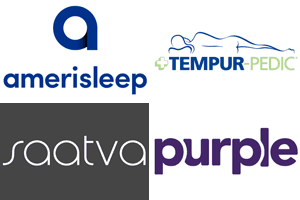 The first is the many different ways companies have found to increase the breathability of their mattress. This includes technologies like a thinner cover, or incorporating other materials like gel, copper, or graphite into the mattress itself. These methods all help increase the amount of airflow produced throughout the mattress, helping to take the heat away. If you’re concerned about having an overly hot mattress, there are a few things you can do to ease your fears. Remember, when it comes to managing aches and pains, the softness or firmness of your mattress is secondary to the support you get from it. The material that makes up the top layer of your mattress can play a large role in determining how much support and softness you can get. For example, poly foams, latex, and memory foam will all likely provide a good amount of support, no matter how soft they are. However, options like pillow tops or padded covers are likely to make back pain worse, as these materials offer softness but no support to go along with it. We’ve done our best to ensure that every mattress on our list will provide you with both the softness you need to be comfortable, as well as the support you need to wake up free of aches and pains.